Today I have another sneak peek for you and a couple of the new Art Stencils being released Mon. June 14th by Layers of Color! I have to tell you we on the design team have been having so much fun playing with these stencils, as they are so fun and versatile! This birdhouse ornament was purchased from Michael's as a plain cardboard ornament. I painted it with Acrylic paint and then, used the Layers of Color Art Stencil "Botanical Swirls" and T Holtz distress Ink to stencil in the greenery on the house. The flexibility of the stencils allows you to stencil things that you could not stamp because of space. I just moved the stencil around until I found a part of the pattern that I wanted on each side of this ornament and stenciled. 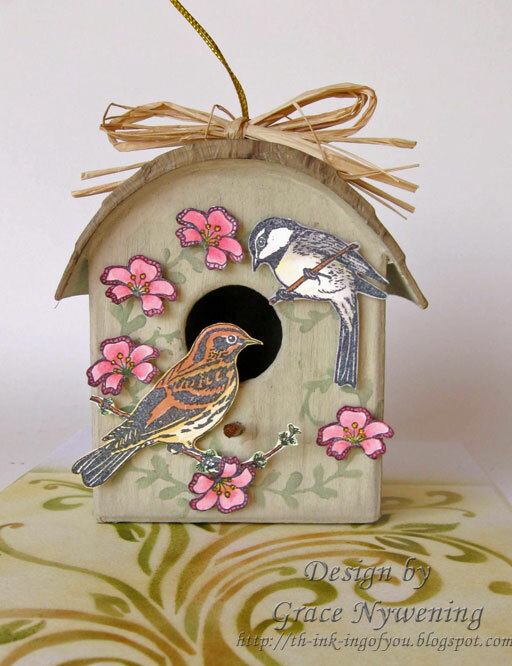 I then decorated the bird house using the Layers of Color Art Stamp sets "Backyard Birds" and "Nature Walk" for the flowers. I colored with Copics, cut out and popped up on dimensionals. For an organic feel I tied on some raffia at the top. This was so simple. DON'T FORGET.... Monday, June 14th will be the RELEASE PARTY for these art stencils! From now until June 14th you can sign up to win the complete release of all 7 Art Stencils! Visit the Layers of Color Blog to sign up NOW! All the designers will be sharing new art stencil sneak peeks on their blogs throughout this week. So be sure to visit them often!!! At the party we’ll have a fun BLOG HOP, tutorials and art galleries full of inspiring projects! See you at the party, JUNE 14th! Grace I absolutely LOVE this....I think you were reading my mind, I was just looking at templates last night for a birdhouse and you sooooo gave me more inspiration sweetie..TY!!! I so gotta try on of these yours is BEAUTIFUL!!!! What a fabulous little birdhouse, such a great ornament or decoration for the home. Pretty color choices again, as usual! Grace this is gorgeous. I love how the stenciling looks on the sides of the house. This is gorgeous Grace! Sweet ornament for a hostess gift.The stencils look like so much fun, great sampling so far! This is my "spring" collection. I keep saying I'm going to create more for different season's but time always gets away from me. Have a wonderful day, and I can't wait to see what else you girls come up with to inspire us! Grace this is so sweet and realistic - love what you have done here!! i am left in awe at your work - you are an inspiration. Ohhh Grace this is LOVELY!!! This would make a GREAT gift!! 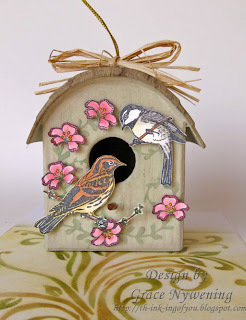 Gorgeous bird house just love everything about it. Thank you for joining us at TT this week. you've turned "plain" into extraordinarily beautiful! 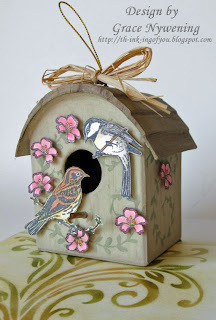 Definately one of my favorite projects of yours (prolly cause I collect birdhouses) ☺ Love the shape and stenciled work and everything--cute cute!! Absolutely gorgeous! Thanks for sharing it with us at TT this week. 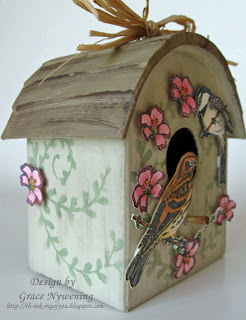 I also have many birdhouses but none as lovely as this one, great job! Oh! this is absolutely gorgeous. sweet work !! lovely images !! thanks for joining in our challenge.